Fifteen times between May 5, 2005, and October 6, 2006, an unidentified customer walked into Charlotte’s Furniture Store in El Paso, Texas — an establishment owned by Beto O’Rourke’s mother, sitting on a site partially owned by Beto himself — to buy furniture. He must have needed a great many sofas and chairs. On each visit to the store, he spent between $22,000 and $50,000 in cash. Over the year and a half, this unidentified customer dropped a cool $630,745 in cash shopping for furniture. Then Beto’s mom divided the cash into separate piles of less than $10,000 each and recorded them as deposits. Why $10,000? To avoid having to report the suspicious transactions to the IRS. She was arrested, indicted, and, on May 11, 2010, convicted of “structuring transactions to avoid reporting requirements.” U.S. District Judge Kathleen Cardone fined Mrs. O’Rourke $250,000. Startlingly, neither the prosecutors nor the judge made her disclose the name of her customer, despite the obvious and natural implication that his (or her) cash stemmed from ill-gotten gains. Beto lived under the protection of his father, Pat O’Rourke, the local political boss of El Paso County, Texas. Pat’s life was controversial. In February 1983, sheriff’s deputies installing a two-way radio in his car “discovered a tied condom containing an off-white powder they believed to be either cocaine or heroin. The sheriff’s captain ordered the substance destroyed” and hushed it up. The incident came to light several months later, in October 1983, when the captain was indicted by a grand jury on charges of official misconduct and tampering with evidence. The captain lamely said he believed the drugs had been planted by one of O’Rourke’s political enemies. In yet another instance of covering up for his son, Beto faced only the basic DUI charges for an incident involving so much more. 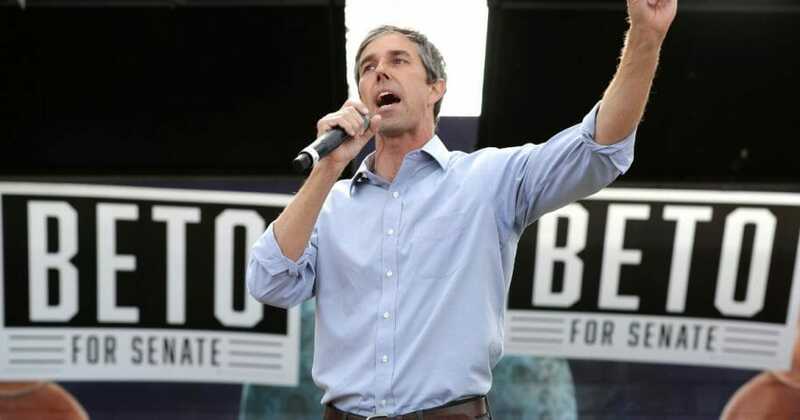 Aged 26 — on the night of his birthday — O’Rourke was speeding on a Texas Interstate long after midnight (exceeding the 75 mph limit) when he struck a truck, crossed the large grassy median strip and came to a stop. He tried to leave the scene of the accident, according to a police report, but a passing motorist made him stay. Police said he “was unable to be understood due to slurred speech, had glossy eyes, and smelled of alcohol.” His blood alcohol was measured at 0.134. But he was not charged with leaving the scene nor with a more serious vehicular felony. Instead, the charges were dismissed after O’Rourke completed a court-approved diversion program. The Washington Post noted that Beto’s father “had been El Paso Country judge from 1982 to 1986 and was running for the position again” at the time of the 1998 incident. Pop’s intervention may have saved Beto once before. In 1995, at age 22, he was arrested on the campus of the University of Texas El Paso campus for “attempted forcible entry” of the University “Physical Plant” and had to spend the night in jail. There is no evidence of Dad intervening in either arrest but connect the dots. With this family history, particularly his father’s brush with the discovery of cocaine in his car, it is odd that the O’Rourkes did not have to reveal the name of her disclosure-averse furniture customer. Now that Beto is running for president — and his mother is still living — it would seem appropriate to press them for information about the tax-evader they assisted in the commission of a felony. It is obviously relevant to know if the customer was involved in narcotics or organized crime. Her son is, after all, running for president.